This summer McDonalds opened its new flagship restaurant location in Chicago. Built on the site of the classic Rock N Roll McDonalds, the new location is a 19,000-square-foot timber, steel, and glass building occupying an entire city block. The main facade of the new building is a 125’-wide by 30’-high VS1 glass wall with all-glass vestibules at either end. The 10” VS1 heavy mullion free-spanned the 30’ floor-to-roof opening. There are eight all-glass corners, a standard VS1 feature. Inside the restaurant is an open-top floating garden with ferns and white birch trees. The garden is 20’ deep by 30’ wide, and surrounded by VS1 glass walls that open the restaurant to natural light from above. Adding even more natural light is a 3’ continuous VS1 skylight extending back from the main facade and wrapping around the entire perimeter. 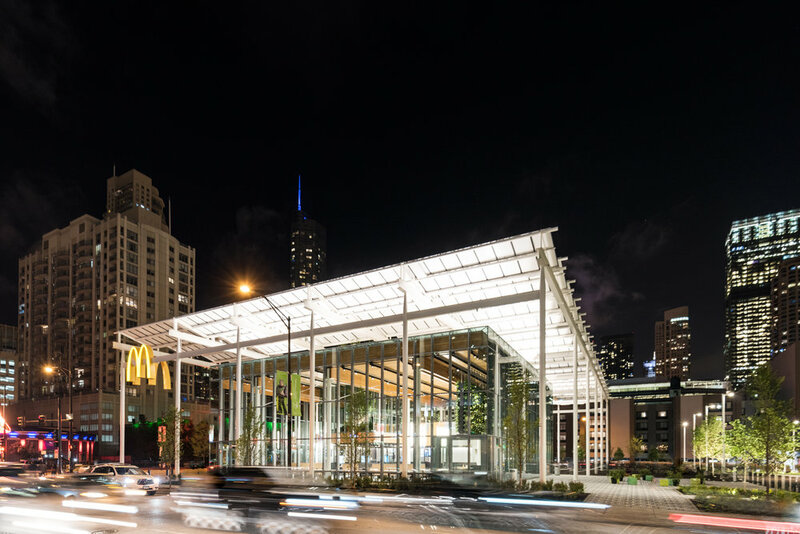 The building is LEED Platinum certified: “McDonald’s corporate commitment to ‘make sustainability the new normal’ is at the core of the new restaurant design,” according to Ross Barney, the project architect. The site has 70 trees at ground level, and 1,062 solar panels on the roof.